Stop Swimming in Circles! Open water can be alluring (tropic seas, mountain lakes) and intimidating (“I’ve never swum with without walls and lane lines around me”) in equal measure. But it can also be a place to experience a higher level of personal accomplishment – in ways pool swimming cannot match. Not to mention the freedom of swimming without the usual boundaries and limits. Since his 55th birthday in 2006, TI founder Terry Laughlin has become the most accomplished open water swimmer of his age in the US, completing his second 28.5-mile Manhattan Island Marathon, winning four National Masters championships and breaking long-distance records three times. 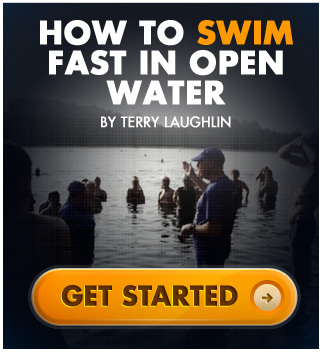 In Outside the Box Terry shows how he has transformed himself from an undistinguished pool swimmer into an elite open water swimmer by turning every open water challenge into an opportunity. And Terry, along with other TI coaches (including three National Masters open water champions) demonstrate how they have learned to love – and thrive in – open water. Part One, “Perpetual Motion Freestyle,” illustrates five key open water techniques that you can learn in the pool and turn into habits with open water practice. Terry demonstrates how to replace unfocused swimming with purposeful practice that develops a Tireless Stroke to hold a consistent pace over long distances and thousands of uninterrupted strokes; and a Stable Stroke that resists breakdown in even the roughest conditions. Part Two, “Swim With Friends” illustrates enjoyable and absorbing partnered-practice options that develop skills essential for effective racing: (1) hold your own in the “controlled chaos” of race starts and turns; (2) save energy by drafting; (3) swim comfortably in a pack; and (4) get your bearings and navigate unerringly -- but most of all to enjoy swimming more than you ever have in a pool. Both parts also show you how to develop “mental stamina” that put you in a cocoon of concentration amid the unfamiliarity and distractions that intimidate many pool swimmers in open water.